this blog needs a new tagline. i'm taking suggestions. 6 Minutes: Fumbling around in the fuse box trying to figure out which breaker cuts power to the kitchen. 3 Minutes: Fumbling around in the dark because I flipped the wrong breaker. 10 Minutes: Digging through the closet looking for an extension cord to run a light to the kitchen so I can see what I’m working on. 5 Minutes: Emptying out the contents of the light fixture box onto the living room floor. 20 Minutes: Pulling down the old light fixture. 3 Minutes: Yelling at the old light fixture because it won’t come down. 2 Minutes: Yelling at myself because I cut the source wires too close to the junction box, thereby complicating the rest of my evening. 1 Minute: Deciding I can do this without the instructions. 43 Minutes: Trying to wrestle the new fixture into place. 2 Minutes: Realizing I probably should have read the instructions. 5 Minutes: Stripping wires with a razor blade. 15 Minutes: Waiting for my finger to stop bleeding. 7 Minutes: Waiting for my cordless drill to charge. 18 Minutes: Arms over head. More wrestling. 3 Minutes: Letting the blood rush back into my arms. 2 Minutes: Steph letting the blood rush back into her arms. Highlight of my St. Patrick’s Day? 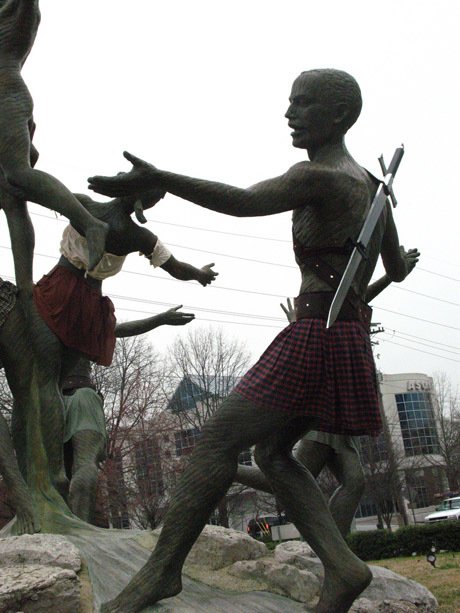 Definitely driving to work this morning, looping around the Music Row roundabout, and looking up to see that the infamous statues had donned KILTS!! Jury is still out on whether or not this was simply a St. Patty’s Day prank, or if someone is trying to make a statement against unclothed bronze people. Picture thanks to Morgan Levy / Nashvillest. More available here. TRUE FACT #1: I enjoy cooking from time to time. Which comes in handy because I tend to get hungry about 3 times a day. 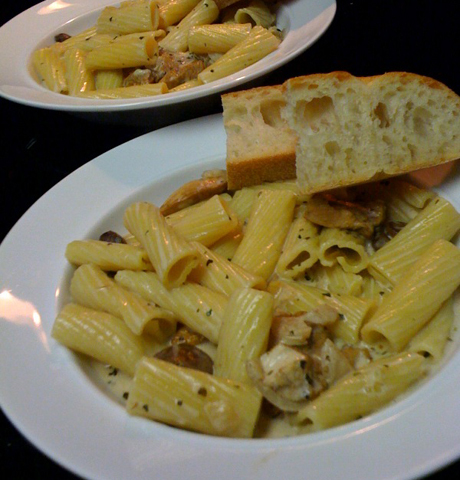 TRUE FACT #2: The ‘Rigatoni D’ at Maggiano’s Little Italy restaurant is the best pasta dish ever. That said, I set out this weekend with one goal in mind: to recreate Maggiano’s Rigatoni D to exacting standards and relish in wonderful Italian food. Actually I just Googled for a Maggiano’s Rigatoni D recipe, found one, and threw all of the ingredients in the same pot. I was incredibly pleased with the result. It tasted amazing! News flash for any of you other Rigatoni D fans though… not the healthiest dish on the planet. There’s a half stick of butter and a 1/2 quart of heavy cream in there. Edible heart-attack. Tastes good though. Click here if you can’t watch the video. 6 out of 7 dentists agree that this is burnshead's blog.